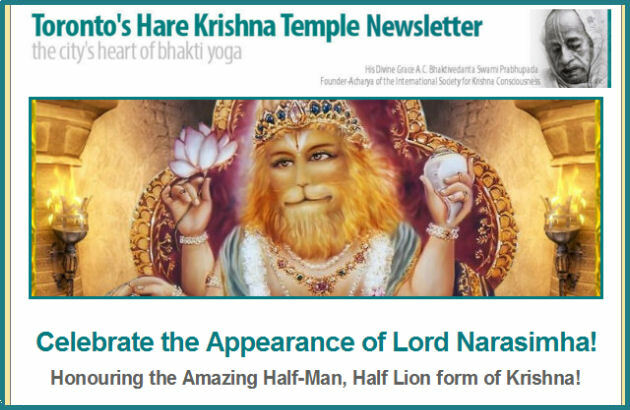 View Our Monthly Newsletter - May 2016 ~ The Toronto Hare Krishna Temple! We are happy to share our May edition of our monthly newsletter! Special thanks to Thulasi Sathianathan, one of our active young devotees, for taking the lead on the monthly newsletter project. Click the image below (or click here) to open the May 2016 newsletter. Remember, you can receive our monthly newsletter right in your inbox by clicking here to sign up, or by using the sign up form on the right hand side of this page! Hare Krsna!